From Forested Flats Camp (Mile 238.6) to Hwy 18 (Mile 266). Chris here. Wow. Our first marathon day. My legs/feet/hips are not happy with me. But I am so happy. Woke in the most beautiful campsite: another butterscotch glade of Jeffrey Pine and Cedar. Cold (about 39 F). But then, cold is only relative to how much/quickly you are moving (I am slowly discovering this on the trail). I think I could have put on shorts and a t-shirt, broken camp, and gotten moving without food at all, and I would have been warm without food assistance. Anyhow, got moving through a rich conifer forest. We were all feeling pretty good - despite our Herculean battle with the elements yesterday - and quickly found a nice fast pace. For the first time so far it really felt like we found "our" stride (at least one that we all felt happy and comfortable with). We zoomed for the first half of the day. Took a midday nap on a shady rise. Zoomed again. Passed a bunch of film stunt animals in cages (lions and tigers and bears ...). Then, just as we were starting to fade, we encountered a wonderful trail magic oasis: we stumbled onto a sofa and three coolers full of soda, oranges (OMG! ), cookies, and chocolates. The cache was hosted by the Big Bear Hostel in BB Lake. So, although it was not our plan when we set out for the day, after being rejuvenated by the citrus trail magic, we decided to hike the extra 14 miles into town and stay at the hostel for the night. 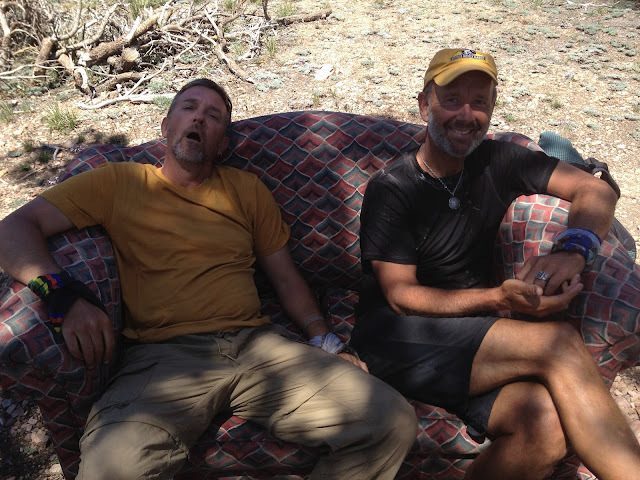 Seano and Pan (Charles) on the "trail magic" sofa. Soft feels ridiculously good to us right now. 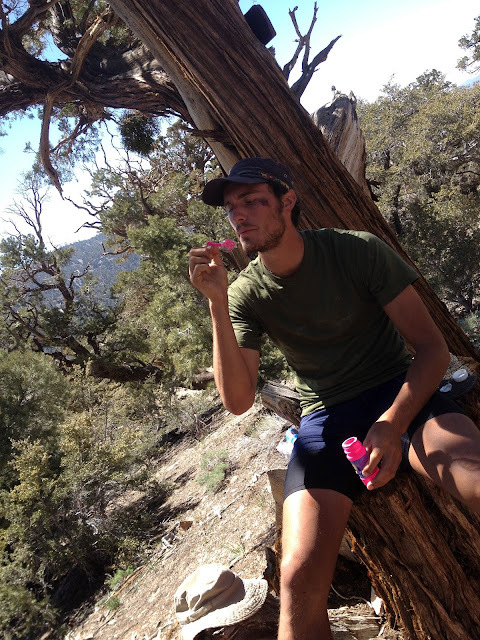 Dionysus (Chris) happily blowing bubbles under a western juniper. It was also our first opportunity to hitch into town. We didn't even have a chance to do our Mikado "Three Little Maids" routine with the GoLite parasols; someone with a big pickup drove past then turned around and picked us up. And then someone else did the same. Nice folks, especially because it is against the law in Calif to drive with people in the bed of your truck (are illegals smuggled this way?). Cold, but ridiculously fun to see the world from lying in the bed of a truck, trees all around you wheeling and zooming, seemingly sprouting out down from the ground. (Big Bear, oh yeah, great telephone wires there). So, our first marathon+ day. Our legs/feet/hips are not happy with us. But, with AYCE (all you can eat) Chinese buffet in our bellies, and the prospect of a zero day and more town food in our immediate future, we are so happy.